Manufacturer & Exporter of Digital Signage TV. Our product range also comprises of LED Video Display, LCD Video Wall and LED Display. Customers can avail these from us at most competitive rates. 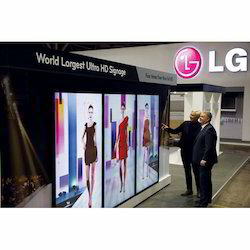 We are one of the accredited manufacturers, suppliers, traders and exporters of a premium range of LG Digital Signage TV. All our products are designed and manufactured using quality components that are sourced from the authorized vendors of the market. Post-production, we inspect these TVs on certain well-defined parameters of quality to rule out every possibility of defect. Looking for Digital Signage TV ?